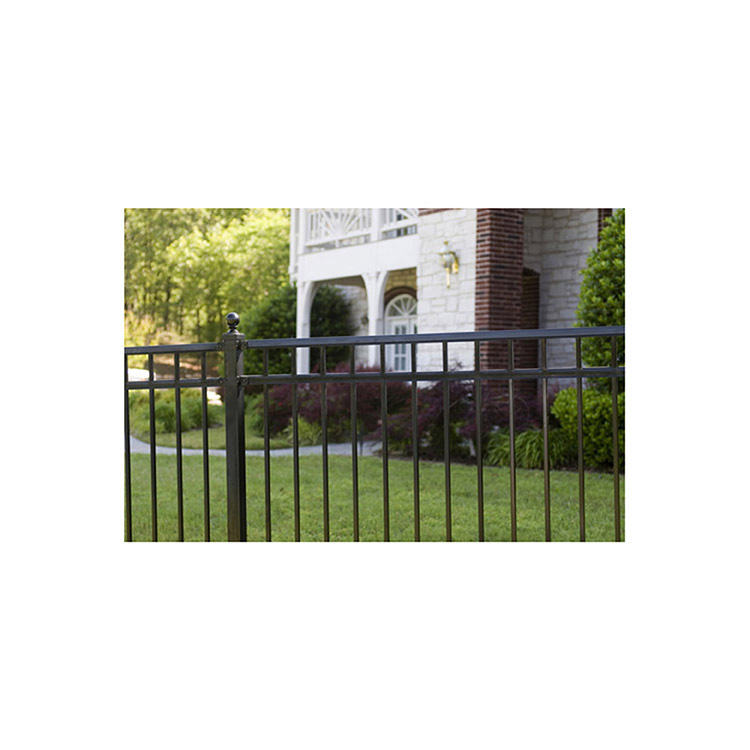 Ameristar Montage Majestic Steel Fence Section, 3-Rail, Flush Bottom | Hoover Fence Co. Lawn equipment, falling limbs, meter readers, rough housing teenagers - all these contribute damage and wear to a fence. Only welded steel fences will stand any chance to survive these long-term abuses. Ameristar has used the Profusion® welding system that creates a rigid weld, yet virtually invisible, structural connections with no unsightly exposed fasteners. 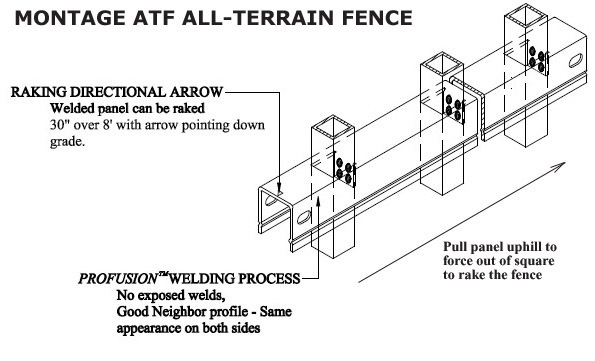 The patent pending ATF™ (all terrain fence) panel design enables the maximum bias for all Montage styles. It is the only welded steel fence with the capability to follow severe grade changes and it follows uneven ground contours like a second skin. Suitable not only to residential users but to commercial applications such as retail businesses, storage facilities, schools, golf courses and recreational parks. Montage steel fence has a maintenance free E-Coat finish making Montage suitable for any climate, hot or cold, wet or dry. Ameristar uses the same cyclic testing technology used in the automotive industry to ensure that Montage fence will not only endure harsh environments, but will withstand the repeated seasonal shifts in weather and temperature. All components are covered by a manufacturer's 20 year warranty. Montage® Material Calculator Worksheet (PDF). Montage® ATF™ Fence System Brochure (PDF). Posts: 2" Square x 16 Ga.
Ameristar Montage® System Specifications (PDF). Ameristar Montage® System Specifications Addendum (PDF). How do I know how much fence to buy? Measure the area where you would like install your fence, and follow the easy to use instructions on the material calculator. Even easier and often more accurate, just fax or email a rough drawing with the dimensions and gates showing, and let us figure the quantities and give you an accurate estimate of all parts and costs. What tools will I need to install my fence? You will need a post hole digger or an gas powered auger to dig your holes. A wheel barrow is recommended for mixing concrete. You will need a level, a tape measure, stakes and string for laying out your fence lines and setting your posts. You will also need a screw gun or cordless drill for attaching your brackets and a socket wrench to install your gate hardware. You may need a hacksaw or reciprocating saw should you need to cut any panels. You also may want to check out the Oz-Post post anchor systems that drive into the ground and require no digging! The recommended posts are the I2-850 for 2" posts (Montage), and the I25-850 for 2-1/2" posts (Montage Plus). What special attention must be given to panels that have been cut down? Remove all metal shavings from cut area immediately after cutting rails. Apply zinc-rich primer to thoroughly cover the cut edge & drilled hole. Allow paint to dry before proceeding to step #3. Apply two coats of custom finish spray paint matching fence color. Allow to dry between coats. Using this procedure maintains the manufacturer's warranty (20 years). Post depths vary based on your climate. In colder climates where there the ground can freeze, a depth of 36" is normal. In warmer climates 24" hole depth is standard. Please check your local building codes prior to purchasing your fence to assure a proper post length. 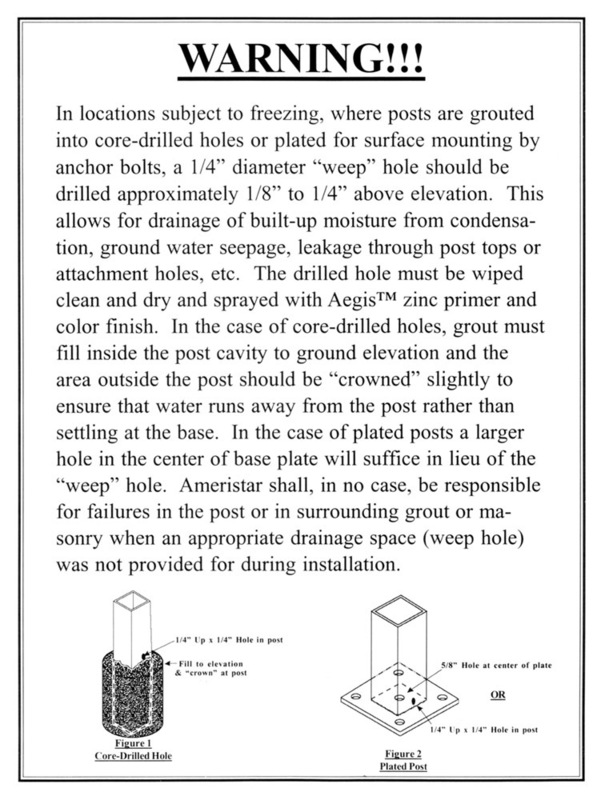 Is there any special considerations that must be given to posts that are set in core-drilled holes or surface mounted? Yes there is! You must drill a weep hole to allow any water that may enter the post to drain properly. See this warning for more information. All locations throughout the United States have underground utility locating service. This service is usually free. The service will come out prior to excavating your holes and locate any underground cables on your property. These services do not locate any utilities that you or a previous home owner may have installed such as electrical lines for outdoor lighting or gas lines for gas grills or pool heaters. Always have your utilities located before your dig! 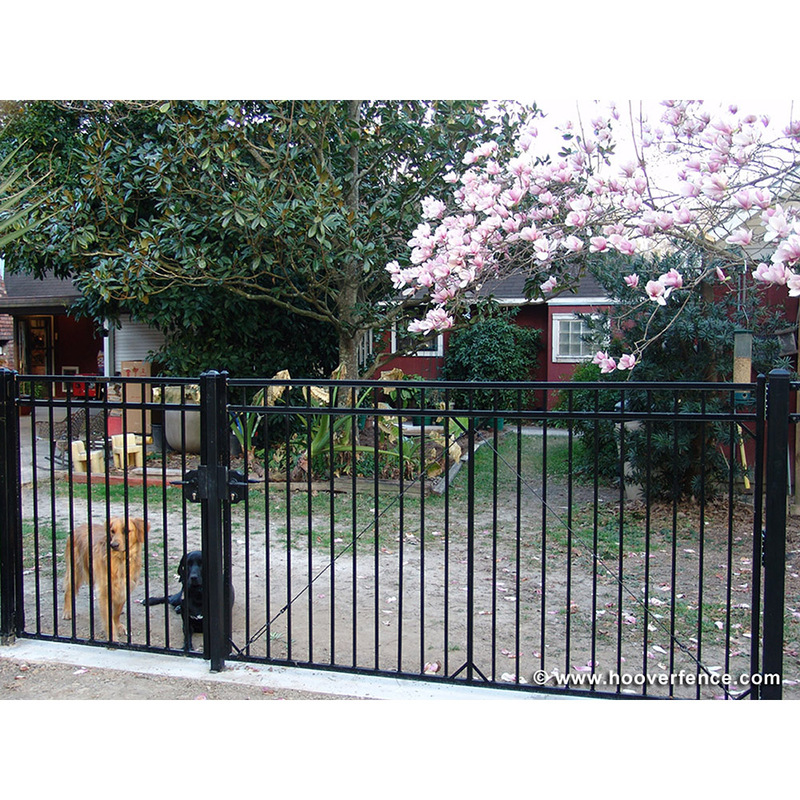 Montage gates are available in a variety of widths from 36 1/2" to 97". If your fence dealer doesn't offer the size you want, they will special order it for you. Longer delivery times can be expected. Bolt-on gate hardware is included with the gates. 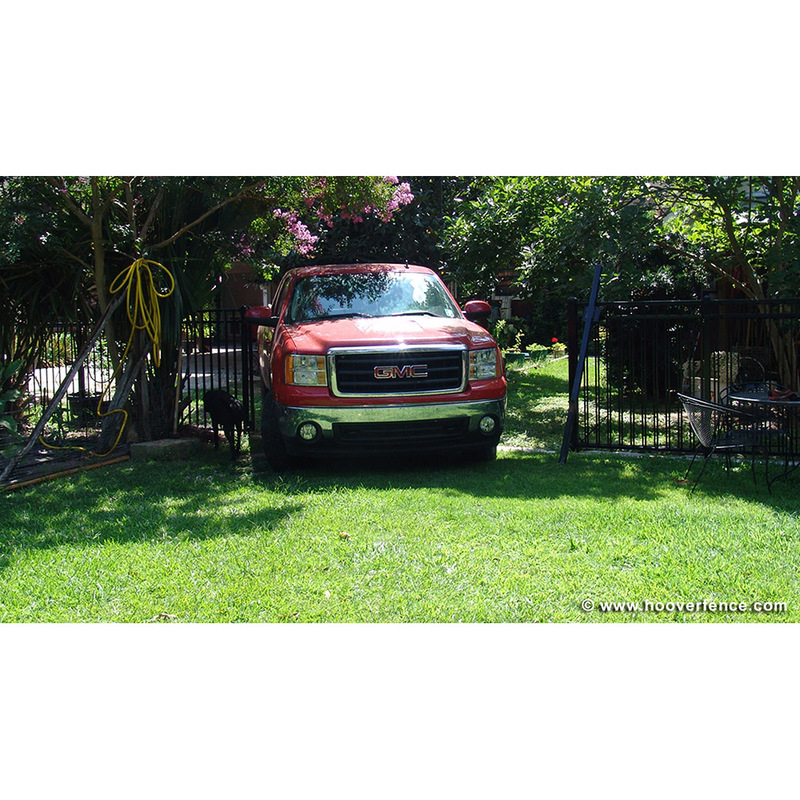 If you are considering a drive gate to gain access to your yard for future landscaping projects or a pool installation, there is no need with Montage. Simply remove the panels from the brackets and you have an 8' opening to your yard. Certain applications such as pool enclosures will require certain types of hardware. Speaking of Pools. Is there anything special I need to do if I enclosing my swimming pool? Yes. There are restrictions on heights, picket spacing and rail spacing for pools, as well as gate restrictions. We recommend contacting your local building department for any local codes or special requirements. Your Montage Fence is manufactured with a state of the art E-Coat finish, and under normal wear will retain it's luster and integrity for many years. Damage to the fence coating such as deep scratches or chips will require the affected area to be touched up with a zinc rich primer and a finish coat. This touch up paint is available through the dealer where you purchased the fence. Harsh chemicals and hard water deposits can affect the appearance of the fence but should not damage the coating. Do I need a permit for the fence? All municipalities are different. Check with you local building code. Who is responsible for getting the permit? You are. Most fence contractors will secure the permit for you if you ask them to. What types of insurance should a fence contractor carry? Fence contractors should carry liability insurance as well as workman's compensation insurance. Ask to see a copy of their policy. How do I know if a fence contractor is reputable? Check with your local chapter of the BBB. Ask for at least three references and call them. Check with the fence product manufacturer to confirm their experience with the product they are selling. Most contractors will pass on the manufacturers warranty on materials. A reputable contractor should warranty his workmanship for a minimum of one year. Use common sense. If it sounds to good to be true, it probably is. Should I give a fence contractor a deposit? Most will require some type of deposit be paid upon signing of contract. Never pay for job in full prior to installation. Simply stated Montage is the best fence product created within the last 80 years. It is a steel, welded panel that can go up and down hills with ease and keep its incredible strength. Montage also has a coating that provides a 20 year warranty. What do they mean when they say "welded raking panels"? How can the pickets be welded to the rails and still be able to be installed out of square to follow the terrain? Ameristar's patented profusion welded panels are indeed welded at the picket and rail intersections. The system provides the strength of welded steel while still being able to force it out of square by lining up an arrow on the rail toward the downward slope and pulling the panel and bending the welded area until the panel is at the desired angle. Click here for more information. How long will it take to receive my Montage? 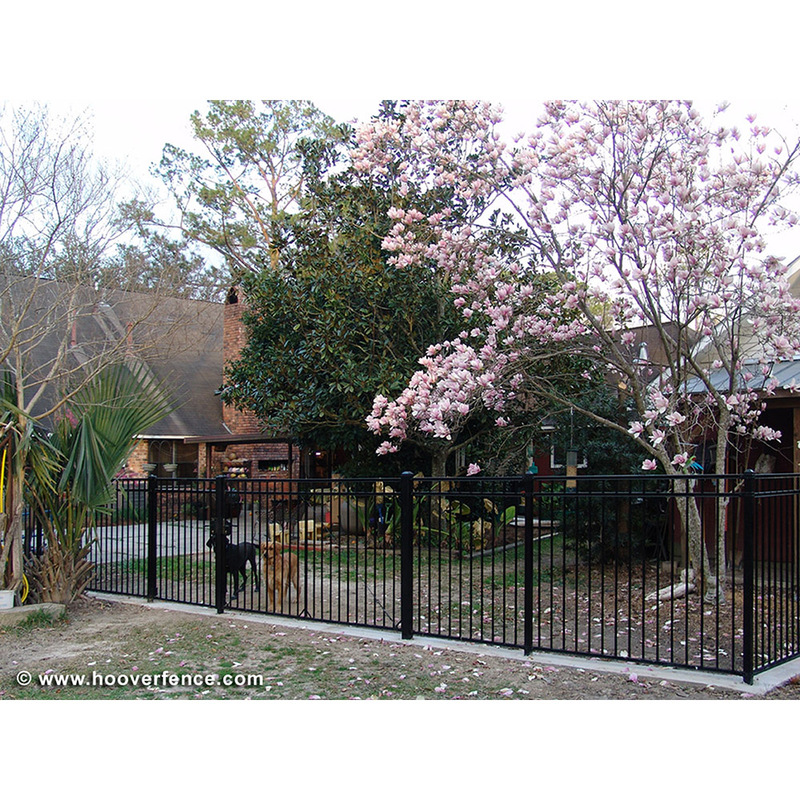 The Ameristar Montage styles we offer at Hoover Fence Company are available and usually in stock to ship within a week. Demand during the summer months may sometimes deplete inventory and longer delivery times could be possible. Please check with one of our customer service representatives if you are on a short deadline. 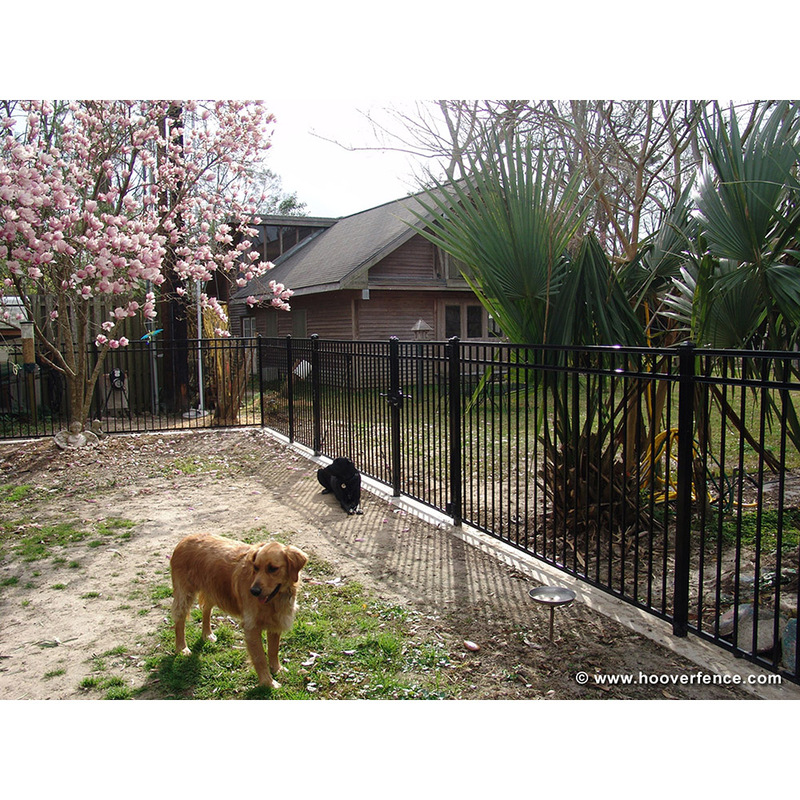 How does the price compare to aluminum fence? 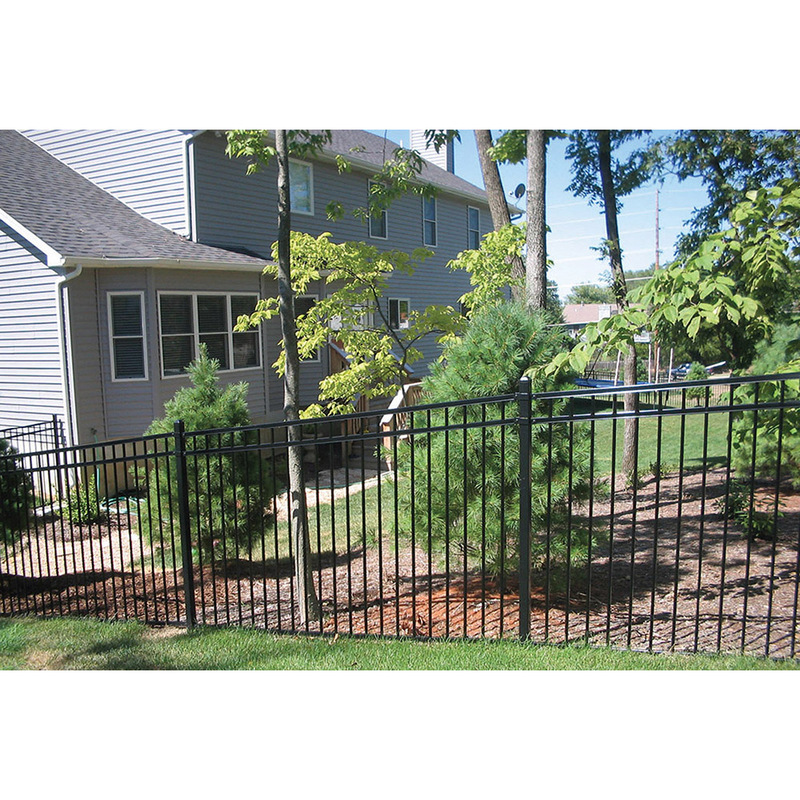 Montage is very price friendly compared to similar looking aluminum fences. How can Ameristar have a better product that matches or beats your competitors price? They have a state of the art facility that can produce our product with high proficiencies. Will lawn equipment such as a weed-eater damage the fence? The only damage it will inflict will be on the surface of the picket. Maybe some scratches to the paint, but not much. Unlike Aluminum fences, Montage will not bend easy. What is a price comparison for Montage vs Wood fence? Wood fence is cheaper in most cases but repairing them and replacing them are a common trait. Will the average home owner be able to install this himself? Montage Fence is the easiest fence to install ever. Refer to our do-it-yourself sections of this website to learn more. Will your fence go up and down hills? Yes, up to 3 feet of grade change for every eight feet of fence. No other welded steel panel can do that in the fence industry. Will a sprinkler system affect your product from everyday watering of my lawn? Everyday moisture from rain, condensation, and sprinklers will not adversely affect the fence's finish, except in cases where the water source contains or absorbs calcium, salts or silicates. Where would I get replacement parts for my Montage fence? Replacement parts will be available at the dealer that you purchased it through. Can I paint over scratches on this fence? Using Ameristar's touch up paint for scratches would be recommended if necessary. Will I ever have to recoat or repaint this fence? If so, how long? No, repainting Montage will never be a chore you will have to do because of our high quality E-Coating System. What is the warranty for Montage? Montage has a 20 year Warranty. Ameristar's Montage ATF Welded Steel Fence is the easiest ornamental fence to install in the industry! Panels come pre-assembled. The hardware is straight forward and the fence panels adjust to sloping terrains, a first in the industry for welded steel fence. Whole sections can be adjusted after fence is erected to get the perfect appearance. Printed instructions will be included with your fence delivery. If any questions arise during your installation, Hoover Fence Company is always here to assist you with expert advise.